New Delhi, India – Clever catchphrases and viral social media campaigns were a defining feature of the bid for power launched five years ago by Prime Minister Narendra Modi and his Bharatiya Janata Party (BJP). The ruling Hindu nationalist party is credited with introducing professionally managed campaigning for elections. Modi continues to be the champion of the hashtag and his party’s pioneering advantage on social media seems intact, as he makes a bid for a second term in office with a freshly minted campaign slogan: ‘Main bhi chowkidar’ (Me too watchman). The ‘chowkidar’ campaign was launched in response to a slogan coined earlier this year by opposition Congress party leader Rahul Gandhi: ‘Chowkidar chor hai’ (The watchman is a thief). Gandhi’s slogan had sought to highlight the prime minister’s role in facilitating an alleged scam in the purchase of Rafale fighter jets from the French company Dassault Aviation for nearly $9bn. “When we were running the campaign that our ‘watchman is a thief’, Modi was completely shaken and just to counter that campaign, he has come up with ‘Main bhi chowkidar'” campaign,” Congress leader Sanjay Nirupam, told Al Jazeera. Launched a fortnight ago, Modi’s ‘Main bhi chowkidar’ campaign features a title song, four short films, caller tunes, mass rallies, T-shirts, caps, badges, and a customary hashtag along with Modi’s trademark video conferences with his supporters. 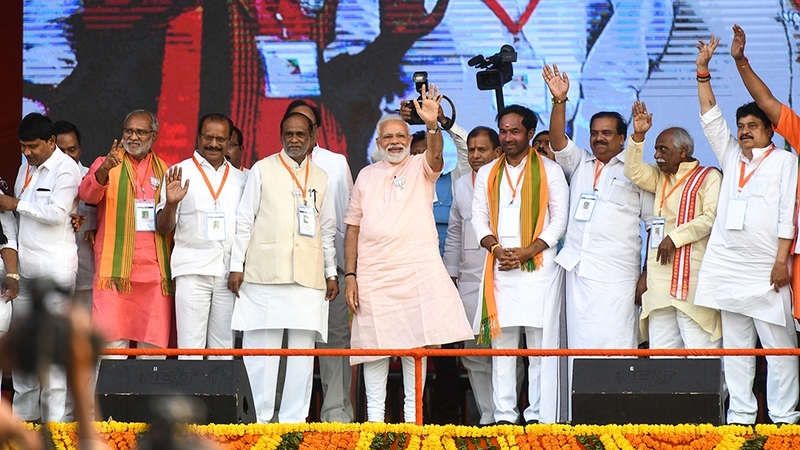 The party also made use of the ‘conversation cards’ feature launched by Twitter and sent personalised messages to those who supported the chowkidar campaign from the prime minister’s official handle. BJP leaders, cabinet ministers and hundreds of thousands of Modi’s online supporters soon followed and added the ‘chowkidar’ prefix to their names. The hashtag used by the Indian prime minister, who has a nearly 47 million followers on Twitter, trended for several days. 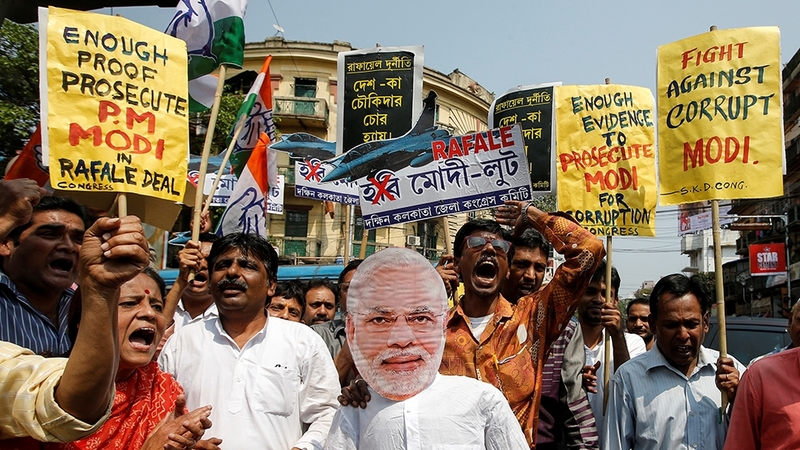 For months, Gandhi has relentlessly taunted Modi with his ‘Chowkidar chor hai’ slogan, accusing the government of corruption and granting favours to corporations that are close to the prime minister. Modi and his BJP party have denied the corruption claims. In the run-up to the 2014 elections, BJP launched the ‘Chai pe charcha’ (Conversations over tea) campaign, after senior Congress leader Mani Shankar Aiyar dubbed Narendra Modi a ‘chaiwala’ (tea seller) and mocked his prime ministerial ambitions saying that a place will be identified for him to distribute tea. The senior Congress leader’s comments were perceived as elitist and a sign of the party’s arrogance, causing serious damage to the party which had fought for India’s independence in 1947. Social media head of Aam Aadmi Party (AAP), the party which currently governs Delhi, said that unlike the 2014 ‘Chai pe charcha’ campaign, the current one isn’t going to help the BJP in the upcoming elections. “At a deeper level what we see is that the BJP and Modi have tried to take the focus away from the real issues that are plaguing the country. The real issues of economy, jobs and women safety are not being talked about,” Ankit Lal told Al Jazeera. But BJP’s national spokesman told Al Jazeera that the ‘chowkidar’ campaign was adopted as a result of the negative campaign by the opposition. Since coming to power in 2014, Modi has coined numerous slogans to highlight issues and government programmes such as ‘Beti bachao beti padhao’ (Save daughter, educate daughter), ‘Swach bharat abhiyan’ (clean India campaign), ‘Digital India’, ‘Make In India’ and ‘Startup India’. But the opposition has accused the Modi government of wasting taxpayers’ money on public relations exercises. Communist Party of India (Marxist) leader Brinda Karat described the marketing of Modi as “unprecedented”. “From the government money, for example, in the Beti bachao beti padhao campaign, half of the funds were spent on advertisements,” Karat said. The chairman of the Perfect Relations public relations firm, Dilip Cherian, told Al Jazeera that “such media campaigning has worked for Modi in the past and he thinks that it might work for him again”. Cherian said that “Modi’s approach is brave” as he takes the opposition head on with his “offensive strategy”. “Modi’s new campaign ‘Main bhi chowkidar’ also allows him to go into the area of defence and national security which is an area of comfort for him,” Cherian said. Next articleThe lawsuit involves nutrition standards championed by Michelle Obama.